Paola Pica talks about money, privilege and bad behaviour. It isn’t easy for me to hear someone speaking badly about a part of the Society I belong to and it would be particularly difficult to do it myself, simply because someone is doing some inquiry about “the scandalous world behind the Italian Upper Classes”. I know that such an interest about such a topic arises not just from really scandalous news about corruption, found in newspapers, but also, and more, from a certain film which was awarded a prestigious prize not long ago. Before starting a discussion about all this, I want to give my point of view on the positive and derogative aspects of the controversy that such a film triggered in Italy on its release. Since the beginning I’ve been on the side of those people, very few I’m afraid, who didn’t agree with the generalized idea of the scandalous lifestyle in the “respectable sitting-rooms” in Rome. I wouldn’t have made such a film the label for the Roman Upper Classes. On the contrary, they are not in the least representative of all wealthy people in Rome and in Italy. I don’t think that such a great beauty in such a great city must be necessarily linked with a scandalous lifestyle. I happen to be with or simply to meet very wealthy people who live their lives honestly and being conscious of their privileged positions, without using drugs nor “throwing their money out of the window” in front of poor people. The thing is that I don’t like generalizations and it was a generalized message, the one which came out of the film and of the prize it was awarded. Many thanks to the director of it and to the jury who awarded his mastery, but I wouldn’t have allowed the spreading of the idea that money is synonymous of scandal in my Country, my greatly beautiful Country. Having said that, I must accept the idea that now the world keeps an interested eye on the Italian lifestyle. Corruption is everywhere nowadays, not only in Italy and not only in Latin countries – and a scandalous way of living usually goes with it. On the other hand, if asked, I must give reasons for some odd ways of living which only money can give the opportunity to lead. 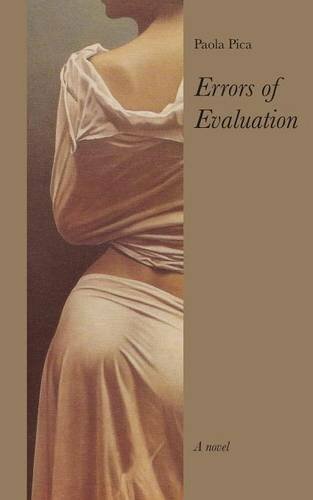 Take my Errors of Evaluation’s environment and you will soon realize that my Francesca feels completely at ease only when she is immersed in money and that even her feelings are strictly worked out by it. All this is obviously due to her upbringing, which was the beginning of a chain of events in her life. Nevertheless, I wouldn’t speak of scandal in her respect but only of how spoilt she was and how sad living with her and, above all, because of her could be. Her husband’s attempt at committing suicide was not scandalous at all; nor was her exploiting other people’s good dispositions to her; which just showed a very bad attitude to everything. When it comes to our own interest, I think that all this can happen on any social level, depending on the individual’s personality. For example, I have heard of elder brothers swallowing up their younger brothers’ “pappa” (a child’s meal) so that they could go back and play in the street, after having performed the task that their poor and busy mother had given them. Wouldn’t you define as “scandalous” such a behavior, aimed at reaching one’s benefit at any cost, hadn’t it had an explanation in the extremely poor environment? So, what else could I say to make it clear that the representation of the Italian Upper Class as a very scandalous one is not a true one and that I find much more scandalous the way that bureaucracy and authorities sometimes make Italian people’s lives harder than one could bear. That might be good food for a film director’s thought. Let me just add that almost all my books, not just Errors of Evaluation, deal with an upper class environment, in which I found a lot to criticize about the opportunities some of my characters were given by money. Nevertheless I wouldn’t say that Francesca or Orlando, the gynecologist in A Respectable Man, or Germano in my next book to be published in English, lead scandalous lives. They simply keep missing all the opportunities that deep and true feelings give to “normal” people. Francesca’s presence pervades the lives of everyone she meets. From the therapist – an ambiguous and even more unscrupulous person than herself – to the husband who, after twenty years of marriage, is left financially ruined and suicidal; and her own cousin, who despite tirelessly attempting to help her in a time of need, has been left betrayed on two separate occasions a decade apart. Three very different characters tell their story about the inscrutable woman who has entered their lives, each one offering their own point of view on who the beautiful Francesca really is. Each has made an error of evaluation which they now realise has prejudiced their lives and their relationships. An omniscient narrator will have the final say. Paola Pica lives just outside Rome, Italy and she has studied and worked extensively in England and her homeland as a translator and interpreter. Today she works for various embassies in Rome, as well as focusing on her writing. She is the author of five novels and one short story collection.